Brett Messer and Stephanie Caron operate Brigid Farm in a nondescript building in Saco’s industrial zone. There are no signs that hint at what takes place behind the building’s locked doors. In Unity, Dawson Julia operates a 14,000-square-foot warehouse on a main road through town, with a sign that indicates the former dairy building is the home of East Coast CBDs. And up in Fort Kent, Steve Rusnack runs his businesses, Full Bloom Head Shop and Full Bloom Cannabis, out of a storefront on Main Street. All are medical marijuana caregivers, part of what was once a cottage industry that is now rapidly expanding as growers move from garages and basements into commercial spaces where they can cultivate more plants to serve a population of patients that has grown to as many as 48,000 statewide. Nearly 3,000 caregivers are now in business across Maine, up from around 750 in 2011. These caregivers – the small-scale growers licensed by the state to grow marijuana for up to five patients – were once the only source of cannabis for patients who didn’t want to grow their own, but now operate alongside eight highly regulated dispensaries which opened in 2011. That competition, along with the need to cover operating expenses and a desire to provide medicine to more people, has prompted caregivers to invest in larger growing operations, diversify their products and find ways to increase the number of patients they serve. Some have increased business – and revenue – by keeping a revolving list of patients, a practice that takes advantage of a gray area in state law but draws criticism from dispensaries and prompts inspections from the Department of Health and Human Services, which regulates the medical marijuana program. Many caregivers in Maine are also poised to make the move into the recreational marijuana industry if voters in November approve Question 1, a citizen initiative that would legalize marijuana for adults and require that 40 percent of licenses to go to small-scale growers. Industry leaders in Maine believe the state is poised to become a leader in the billion-dollar cannabis market. For the first decade after the state’s medical marijuana law was approved, patients either grew their own plants or designated a family member as a caregiver to do it for them. That changed in 2009, when amendments to the law allowed caregivers to serve up to five patients, not just their own family. Those changes allowed the program and the caregiver industry to expand as more patients sought alternatives to pharmaceuticals. The caregiver industry continued to evolve with a 2013 amendment to state law that allows caregivers to hire an employee. The number of individual caregivers jumped by more than 80 percent from 2013 to 2014, to 2,161 caregivers. Since then, the number of caregivers has increased to 2,726, according to the Maine Medical Marijuana Program. The number of caregiver employees jumped by 493 percent in 2014, from 14 to 83. Seventy-six of those employees were new, according to data provided by the Maine Medical Marijuana Program. There are now 158 active registered caregiver employees. The economic impact of caregivers is hard to pin down because the state doesn’t specifically track their sales, income or the tax revenue they generate, but industry experts say caregivers operate thousands of “mom and pop” businesses across the state. The dispensaries last year sold $23.6 million of marijuana and generated $1.3 million in tax revenue, according to Maine Revenue Services. Caregivers charge an average of $150 to $250 for an ounce of medical marijuana and can sell up to 5 ounces to each patient every month. Caregivers themselves can take home between $24,000 and $50,000 a year while creating jobs and supporting other small businesses, according to industry experts. Kim Printy, executive director of the trade group Medical Marijuana Caregivers of Maine, said the revolving slot business model, where patients designate a caregiver only for the length of a single transaction, grew out of a desire by caregivers to serve more than five patients. Efforts in the Legislature to remove the cap on patients have been unsuccessful. The exact number of patients is not tracked by the state, but 48,346 forms certifying people as patients have been printed by doctors in the past year. It is possible some of those forms were duplicate or replacement forms, according to the Department of Health and Human Services. State law says caregivers can have up to five patients at one time. Though the intent of the law was for caregivers and patients to have long-term relationships, the law doesn’t specify a length of time the relationship must be in place. Some caregivers say they use that flexibility to serve many patients in a day, while making sure that only five have designated them as the caregiver at one given time. A patient’s caregiver is determined solely by the patient’s preference as indicated on a state-approved designation form given by the patient to the caregiver, according to state law. The patient can end the relationship whenever he or she wants. When a patient uses a caregiver’s revolving slot, the patient will designate the caregiver just long enough to meet and purchase the medical marijuana. The patient then takes the designation form home, effectively ending the relationship. The Department of Health and Human Services, which oversees the medical marijuana program, did not respond to several requests for comment. Julia, the caregiver from Unity, knows he’s operating East Coast CBDs using a gray area of the law, but says that’s what needs to be done to stay in business and provide medicine to patients who are looking for strains of cannabis that don’t make them feel high. Julia’s wife and mother are also caregivers operating out of the same building. They have three full-time employees. After he first became a caregiver in 2010, Julia had patients reach out to him who occasionally wanted cannabidiol, or CBD, strains, but it was difficult to reserve a slot for patients who didn’t buy from him regularly. Cannabidiol is one of two main ingredients in the marijuana plant but is non-psychoactive like tetrahydrocannabiniol, or THC. “That’s when I reached out to my attorney and asked them how we could do this in a way so I could never have more than five patients and be in compliance with the law,” he said. Julia and the other caregivers at East Coast CBDs now each keep four long-term patients and reserve their fifth spot as a revolving slot. He won’t disclose how many patients they work with, but adds, “Let’s just say it’s a lot.” Patients can go to his building to pick up their medicine and meet with caregivers. Rusnack opened his storefront on Main Street in Fort Kent in May. The space is divided into two sections: a head shop that is open to anyone and a medical marijuana store open only to the patients he and his wife serve. Rusnack, who ran logging equipment before injuring his shoulder, became a caregiver more than four years ago. While growing at home, he began talking to others in the medial marijuana community about his business. “They advised me I was doing a good job growing medicine and I should do it commercially,” he said. Once he set up shop downtown, Rusnack adopted a business model similar to the one Julia uses. He now works with a larger number of patients, but declined to disclose exactly how many. He said keeping revolving slots and operating out of a storefront is beneficial to his patients and helps bring the caregiver industry out of the shadows. Rusnack, 36, will be closely watching the results of the November legalization vote, as will Julia and Messer. Legal pot sales across the U.S. – both for medical and recreational marijuana – soared to $5.4 billion in 2015, up more than 17 percent from $4.6 billion in 2014, according to the ArcView Group, with tracks cannabis markets. Adult use sales grew to $998 million from $351 million in 2014. Colorado alone recorded more than $996 million in recreational and medical marijuana sales in 2015, generating $135 million in marijuana taxes, according to the state Department of Revenue. Messer, of Brigid Farm in Saco, operates his business in a more traditional way than Julia and Rusnack. He and Caron try to keep the same patients for long periods of time, but say that can be tricky in a market where patients want the flexibility to use different caregivers and dispensaries. Caron said Brigid Farm has expanded its line of products – ranging from various strains of bud to edibles like chocolate peanut butter balls – to keep patients from looking elsewhere. They also make capsules and vape cartridges. The couple, who are engaged, moved into a 5,000-square-foot facility in 2014. Messer, 28, had become a licensed caregiver after graduating from college in 2012 with a degree in finance. Caron, 26, became a caregiver 15 months later. At first, they grew their plants in a residential setting, but needed to move into a bigger space if they wanted to cultivate the maximum 72 plants they are allowed to grow. A year after moving into their industrial space, they added a commercial kitchen so they could expand their product line to include edibles. Their building, which has no signs on the outside and is guarded with an elaborate security system, includes several grow rooms, a space for processing harvested marijuana and the commercial kitchen. Their patients never visit the facility, instead relying on deliveries from Messer. Messer and Caron now have two full-time employees, who make $30,000 to $40,000 a year with full benefits. Messer said they could use additional employees if they were allowed to hire more. The couple last year took home about $40,000, a number they hope to increase by adding a more diverse line of edibles. Messer also works as a consultant, helping caregivers set up grows that range in cost from $10,000 to $150,000. Messer, whose first exposure to medical marijuana dispensaries was in Colorado when he visited during college, is excited at the prospect of legalization of recreational marijuana, which he supports. If voters say yes to a legal market, Messer and Caron plan to open a storefront. The changes in the caregiver industry have come with some growing pains. As caregivers move into commercial spaces, municipal officials have grappled with how to zone a type of business they’ve never dealt with before. In Sanford, the City Council recently approved zoning regulations for caregivers in commercial spaces after months of working with growers to understand their businesses. There also has been increased scrutiny of the caregivers who have storefronts or keep a revolving list of patients. Julia says he and other caregivers like him have had multiple visits by inspectors from DHHS who want to count their plants and look at patient paperwork to make sure the caregivers are operating within the law. Julia – who says he passed two inspections without any issues – said many caregivers would like to see the patient cap lifted so that caregivers can sell more of the marijuana they’re already growing. Most plants yield a quarter- to half-pound, giving caregivers the ability to produce more marijuana than their patients can buy. Caregivers can now donate their excess to patients or surrender it to law enforcement, but Julia said the current rules also leave open the temptation for caregivers to divert marijuana to the black market. Roy McKinney, director of the Maine Drug Enforcement Agency, said his agency has discussions with DHHS when there are concerns about marijuana being diverted from the medical market. He said diversion of marijuana is “always a concern,” but not one he can dedicate much of his resources to. 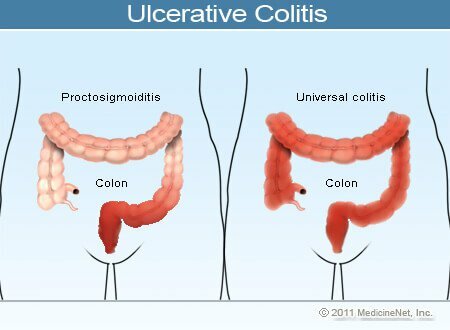 Ulcerative colitis is closely related to another condition of inflammation of the intestinescalled Crohn's disease. Together, they are frequently referred to as inflammatory bowel disease (IBD). Ulcerative colitis and Crohn's diseases are chronic conditions. Grohn's disease can affect any portion of the gastrointestinal tract, including all layers of the bowel wall. It may not be limited to the GI tract (affecting the liver, skin, eyes, and joints). UC only affects the lining of the colon (large bowel). Men and women are affected equally. They most commonly begin during adolescence and early adulthood, but they also can begin during childhood and later in life.